In Northern Arizona, within sacred Navajo Territory, exists one of the most breathtaking sights the American Southwest has to offer. With layers of beautifully contrasting sandstone creating an otherworldly feel, Antelope Canyon is easily one of the most enchanting places on the continent. On the way out to this jaw dropping slot canyon, the drive is accompanied by captivating views of the Vermilion Cliffs and the dreamlike shore of Lake Powell. Antelope Canyon, formed by a millennia of floods is not the only natural marvel visitors get to see on this tour: Horseshoe Bend, the Colorado River’s most famous hairpin turn, was created under similar conditions as the Grand Canyon, equally formed by sediment and debris carrying waters. On our full day Antelope Canyon tours from Las Vegas, guests enjoy continental breakfast to-go, a picnic-style lunch and unlimited bottled water to help them along on this journey! The Antelope Canyon tours from Las Vegas can also be operated as a private tour. Contact a tour specialist for details. Hidden for centuries beneath Native soil, nature has built a cathedral for herself: a slot canyon still unsurpassed in its beauty, the perfect symphony of sand, stone and light, a maze of marble colored rock layers you won’t find anywhere else in the world. In proverbial touch with earth’s past, our Navajo guide leads us through this sacred site. A visual feast unfolds before our eyes as every step and turn surprises with new sculpture like spires, delicate arches and colorful waves. A sandstone spectacle unseen by others, as Antelope Canyon is still being formed by the ferocious forces of seasonal floods. Arguably, not a single disappointing picture has ever been taken in this narrow subterranean ravine. On the contrary, selling for $6.500.000 in 2014, history’s highest priced photograph was shot right here. But it wouldn’t be DETOURS, if Antelope Canyon was the only major attraction we showed you on this tour. The deep blue waters of man-made Lake Powell appear like a mirage as we approach Indian Country. Yet, its dreamlike shores are real, right where the Great Basin Desert meets monsoon run-offs and molten snow from mountains ranges far away. 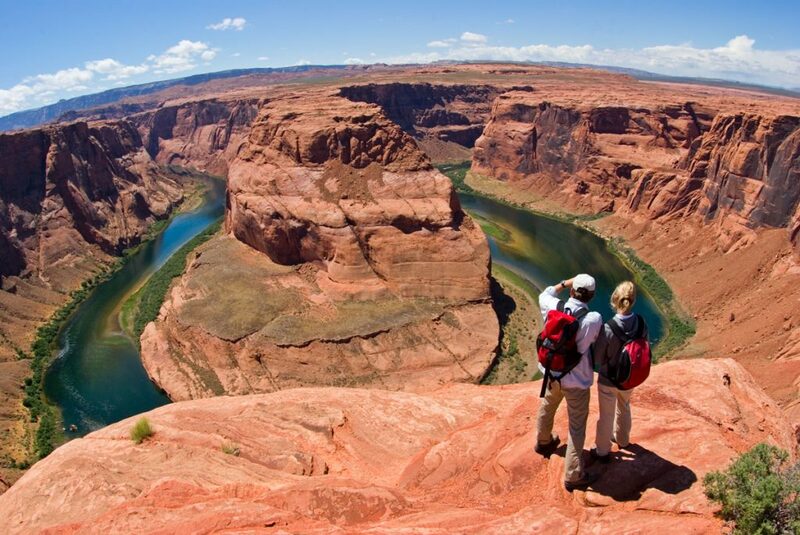 Just as much a sight to behold is the wallpaper-worthy view of Horseshoe Bend. A short hike takes us to the most captivating curve the Colorado River has carved out on his 1400 mile journey from the Rocky Mountains to the Gulf of California. At this sheer 900ft drop, framed by massive canyon walls, the emerald green sparkly reflections of this ancient stream will surely take your breath away. This is the opportunity to make memories of a lifetime as “nature at its best” awaits you out west. An extraordinary outdoor experience you do not want to miss. Let DETOURS guide and get you there. *This tour requires a reasonable level of fitness and includes walking up and down stairs, ladders and loose sand at different times during the tour. Temperatures in Page are typically 5-10°F cooler than in Las Vegas and vary by season. We recommend our guests bring jackets in the event of changing weather patterns. 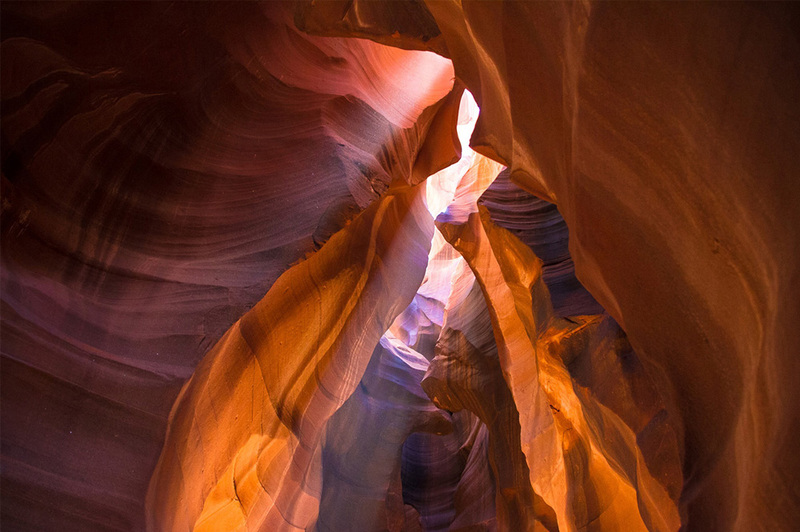 Will we visit Upper or Lower Antelope Canyon? Our tours visit Lower Antelope Canyon, which is typically less crowded and the more spectacular part of the slot canyon. How physically fit should I be to enjoy this tour? Guest should have full mobility and a reasonable amount of fitness. Climbing down a ladder into Antelope Canyon is required. Roundtrip distance to hike to Horseshoe Bend is about 1.25 miles through sand. These are all approximations, please check the weather prior to your tour. Winter temperatures can range from 20-40 degrees fahrenheit. Spring and fall temperature range from 40-70 degrees fahrenheit. Summer temperatures range from 70-100 degrees fahrenheit. Pick up times range from 4:30am-5:00am. We will contact you between 4-6pm the evening before the tour to confirm your exact pick up time. What type of breakfast is provided? Assorted fruit juices, freeze-dried fruit packs, pastries and granola bars. Just a few hours drive away from Las Vegas is one of the nations beautiful National Parks: Zion. Filled with wildlife and landscapes unique to the American West, Zion is a site that everyone should have on their travel bucket list. Enjoy the breathtaking views of Antelope Canyon, Horseshoe Bend and Lake Powell on this two-day, one-night guided private tour from fabulous Las Vegas. This full day tour of Bryce Canyon includes views of the Virgin River Gorge, the Grand Staircase National Monument, the magical hoodoos of Bryce Canyon, and a made-to-order lunch.